Hoisin sauce, sometimes called Chinese barbecue sauce, gives this barbecue ribs recipe a wonderfully exotic flavor and brilliant color. Hoisin sauce is easy to find in the Asian section of any large market. This barbecue pork ribs recipe could be easily adapted for beef and chicken with delicious results. Cut rack of ribs in half and place in large sealable freezer bag. Mix the marinade ingredients in a bowl and pour over the ribs. Marinade for at least 8 hours, or overnight. Remove ribs from bag and pat dry with paper towels. Mix together and apply the dry rub all over both sides of the ribs. Roast in oven at 300 degrees for one hour. Mix all the glaze ingredients in small bowl. 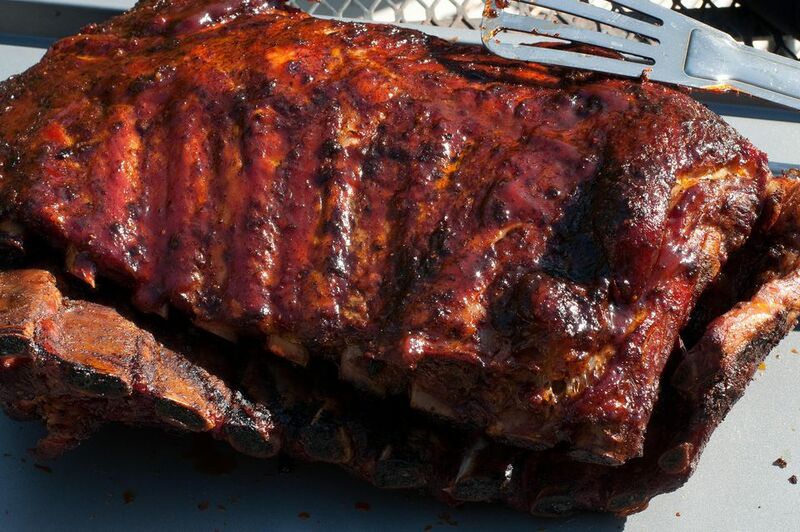 After 1 hour, baste the ribs with a brush on both sides and return to the oven. Repeat this basting every 20 minutes for another 3 1/2 hours to build up a nice thick, shiny glaze. Remove when meat is tender, and cut into serving sizes.